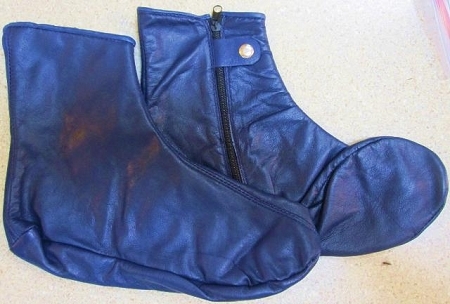 High quality leather socks with a zipper on the side. Custom manufactured by Al-Rashad Books in Pakistan. Available in American shoe sizes 7 thru 15 in various colors. Made with quality leather from zabiha animals. Quantity discounts available. We are able to manufacture per your specification in various color and sizes. I am very pleased with these leather socks"KHUFS". I may order more. They have proven to be very convenient. I bought some of these in green, size eight. I was to learn that a seven fits me better; despite this these little khuffs lasted a respectable time; I mean months of daily wear. Like, dude; they're not Azads. But for the price, especially when you get the price breaks at higher quantities, they can't be beat! Plus they are more festive than the plain black ones which seem to be the only color Azad offers. I only wish Al-Rashad would reorder the green khuffs in size seven so I could, well, buy them. For that reason they get one star less; no matter how good they are, if they're not in stock it doesn't matter. The khufs I purchased arrived in a very timely manner. The product was of high quality. I use them daily. Wish they were thicker leather do to the level of use, and the climate of this region. I am pleased with the product and will purchase more as needed.